Google has apparently allowed some prototypes of its Project Glass augmented reality glasses out in public for testing. Google co-founder Sergey Brin wore the glasses at Dinner in the Dark, a Benefit for the Foundation Fighting Blindness in San Francisco. Technovelgy readers may recall the earlier article Google Glasses With Heads Up Display Coming Soon?, which reported early comments that they resembled Oakley Thump glasses. However, a more slender look is shown below. 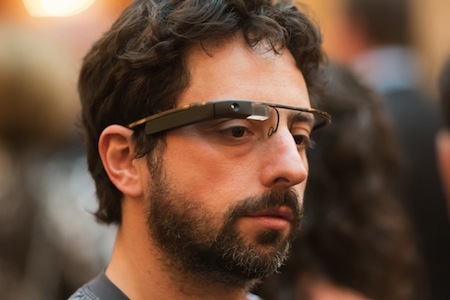 Blogger Robert Scoble tweeted that "Sergey wouldn’t let me wear the Google Glasses but I could see they were flashing info to him" and added that Brin said that the glasses were many months from being a consumer product. An idealized view of the near future of this technology is presented in this Google Project Glass video. For the science-fictional view point, see the overlay specs from Charles Stross' 2007 novel Halting State or the videoshades from Bruce Sterling's 1988 novel Islands in the Net. From Project Glass on Google+, NYTimes and Washington Post; thanks to Winchell Chung for the tip on this story.